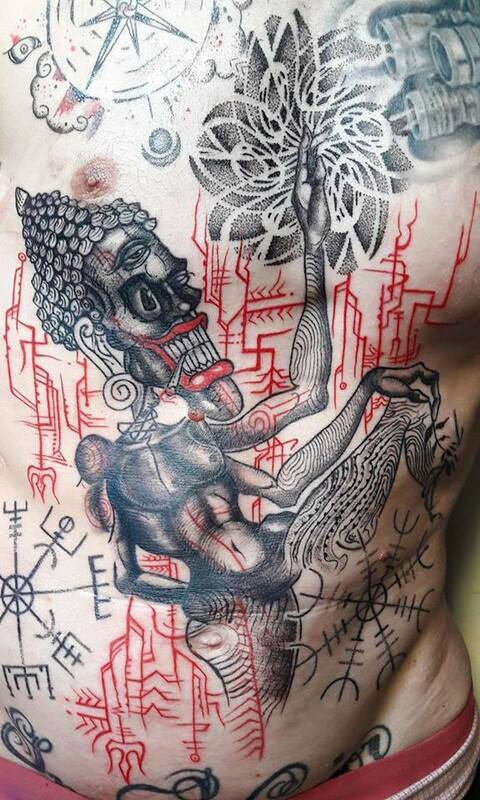 The last year we have seen amazing tattoo collaborations all over India and Nepal. The experience is exceptional: Not only for the artists and the client, but also as a spectator, who is watching a specific kind of magic happening with two machines at the same time. Collaborations combine different styles and create a stunning mash-up of tattooists’ individual spirits and handwritings. Something you cannot predict and the more collaborations happen in different artist formations, we start to see a variety of infinite possibilities. 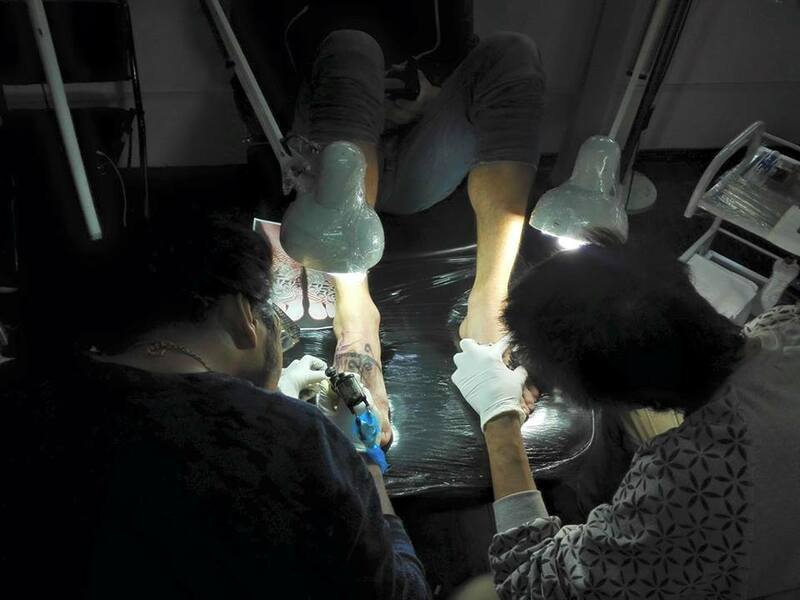 Combining two very different and hypnotising styles, Rojan Shrestha and Avishek Vaidya from Tattoo Junction, Kathmandu stand out and promise a new visual experience in tattooing. Rojan has been tattooing for more than seven years now. He started off with a backpack full of equipment as a freelancer around India and came back five years ago to Kathmandu. He opened his studio Tattoo Junction in Thamel, which is reflecting his personality very much in itself: Climbing up some stairs you escape the hustle and bustle of the touristy streets and end up in a chilled and open space full with art. Avishek Vaidya fits perfectly in the setting of Rojan’s studio. He started off in art school and ended up being the apprentice in Tattoo Junction – luckily! Only after a few years of tattooing, he already has a great impact broadening the portfolio of the Nepalese tattoo industry with his distinctive characters and surreal compositions. When you meet Avishek, you will wonder even more about his style. As known, still waters run deep… and the meaning of his designs run even deeper. There is much more than an aesthetic dimension to them, but they give us the opportunity to keep wondering and find our own interpretations. Avishek will not give away his meanings that easily – or maybe never. Anyhow, it is more than legitimate to leave some work to the spectators, who will have to discover a personal meaning for themselves. Combining those skills, the results are mind blowing. The movement, dynamics and energy of those pieces are the outcome of a powerful geometric and figurative fusion, which results in a new visual experience in tattooing. Again the value and the connection of the counterculture comparing it with the means of so-called Fine Arts are more than evident: Not only within the imagery itself, but also seeing the work of the artists during the whole process from the sketch, the work on the canvas and the visual challenge of the final piece. The tattoo industry, its framework and clients increasingly open up to a vast range of styles, which allows the artists to channel all creativity and work within their own individual handwriting. This diversity can only be embraced. The scene is flourishing in different directions, and we can only be excited and curious what is about to come out of the hands and minds of guys like Rojan and Avishek.